Jugend Eine Welt – Don Bosco Aktion Austria is an international aid organisation and was founded in 1997. The objective of our non-governmental organisation (NGO) is national and international youth aid together with sustainable development assistance. Jugend Eine Welt negotiates Christian motivation in the spirit of Don Bosco, the great Saint of young people. The project partners, the Salesians of Don Boscos (SDB) and the Sisters of Don Bosco (FMA), have been operating as a catholic order organisation for more than a hundred years. Today, some 16 000 Salesians and 14 300 Sisters of Don Bosco work in more than 130 and 90 countries worldwide, respectively. Hundreds of thousands of children and young people have the opportunity of a better future. Jugend Eine Welt, therefore, has a worldwide unique Don Bosco Network available in Asian, African, Latin American and eastern European countries. The organisation is guided by Christian values and supports fair investments. 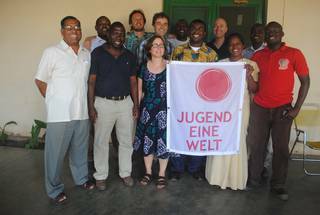 Jugend Eine Welt would also like to contribute to the development of the whole of humanity towards a brotherly community. The objective is a life of plenty for everyone. This includes: having life’s essentials available, freedom from oppression, understanding and knowledge of dignity and and life’s objectives together with skills and freedom of organising your own life and participating in the community.